This lecture is devoted towards the understanding of the Development of Oral Cavity. Section one of this lecture aims at talking about the Development of Mouth. The educator started off by putting forth an Overview. Then the educator moved on to explain about Structure of Oral Cavity. In addition to this, Adult Oral Cavity and various Structures Derived from Mandibular Processes have been described in depth. In the end, the educator concluded by shedding light on the Differentiation of Floor of Mouth. Section two accommodates Development of Salivary Glands. In the beginning, the educator has conversed about the Development of Salivary Glands. Next in line, Major Salivary Glands along with Parotid Glands and Submandibular Glands have been discussed expansively. Subsequently, the educator has elucidated the Sublingual Glands. Furthermore, Summary of Major Salivary Glands has been put forward. Conclusively, Minor Salivary Glands have been illustrated extensively. 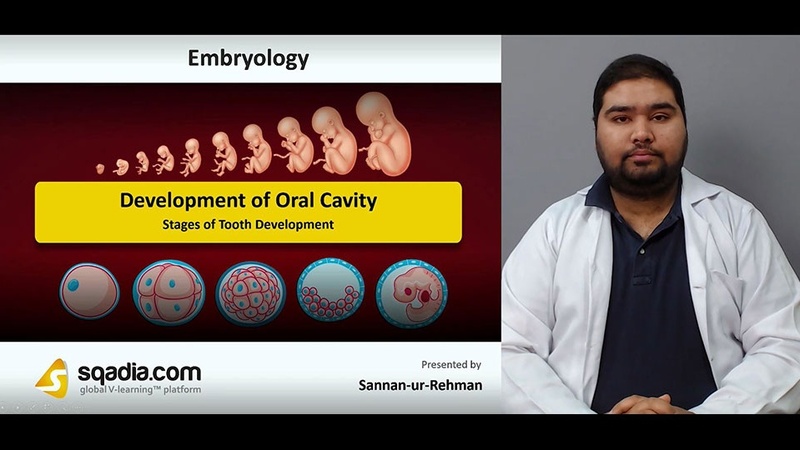 The focal point of section three is to talk about the Development of Teeth. Firstly, the educator has delineated about the Development of Teeth, thoroughly. Secondly, the five Stages of Development of Tooth have been brought into reflection. In the end, the educator winded up by debating over Characteristic Feature of Developmental Stages. The key objective of section four is Stages of Tooth Development. In this section, each stage has been discretely reported. At the start, Dental Lamina Stage has been explicated. Following this, Bud Stage and Cap Stage has been narrated as well. Besides these, the next stages termed as Bell Stage alongside Bell Stage of Development of Lower Incisor Teeth has been taken an account of. In the end, the educator wrapped up by bringing the Apposition Stage under dialogue. Section five emphasizes on the Permanent Teeth and Clinical Correlation. Initially, Development of Permanent Teeth has been communicated about. Succeeding this, Eruption and Shedding of Teeth has been highlighted as well. In the end, the curtains have been brought down when the educator presented the Congenital Anomalies of Teeth, meticulously.